I’ve been progressing well with the Pi-Kitchen, however I put development on hold for a week while I got ready for the @Bristol Digimakers event. The workshop had a pirate theme, although the plans went well, the workshop was far too long to fit comfortably in the allotted hour. Added to the lessons learnt, I know to adjust things next time. I think everyone enjoyed it anyway and many thanks to all that came along, it was a fantastic day. It provides details on running it as the full workshop (which had simulated lighthouses displaying the signals) as well as a version which has all the signals and codes ready on the treasure map so you don’t need the lighthouses. Kudos to those who already knew all about Morse code too! Very impressed. Set-up of the workshop was greatly helped by having the Pi-Kitchen on hand to automatically set-up the four lighthouses with preconfigured scripts running on power-up (details will be in the next recipe..just a few tweaks to be made first). Also, the majority of this Raspberry Pi Python workshop was written using an Arduino Nano…one loaded with Brian Lavery’s Virtual GPIO, which allowed me to write and test the Python scripts directly on a PC. The same Python scripts can then be run on a Raspberry Pi without any modifications! 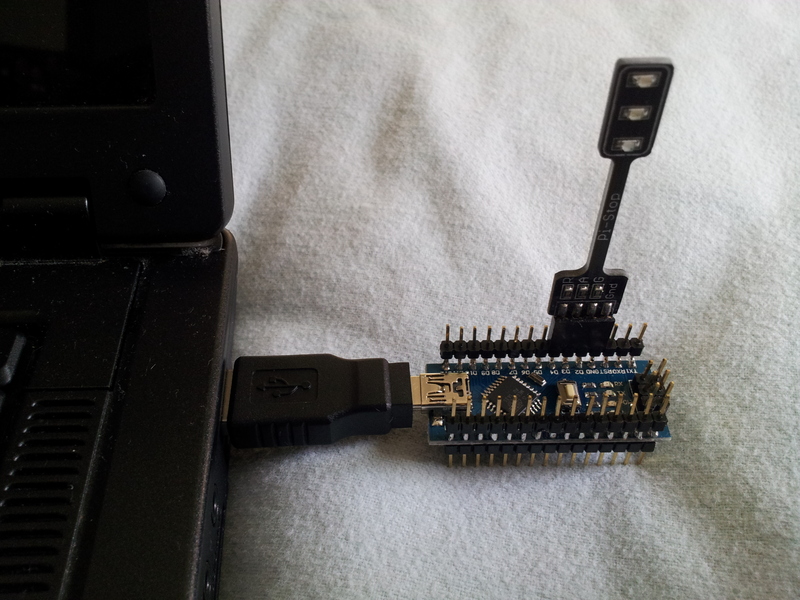 Arduino Nano + mini-USB + Pi-Stop + Laptop = Easy Development! The only difference to a standard Raspberry Pi Python script is shown below. This detects if the RPi.GPIO module is available or not and allows us to set different pins as necessary.